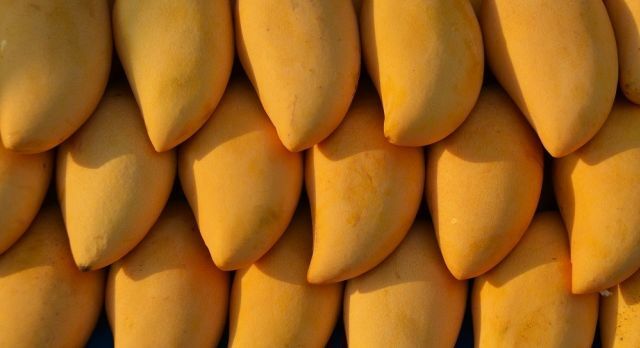 Across India March marks the start of mango season. Airplane cargo holds ferry back and forth entire cartons of mangoes, and favored sellers do brisk daily business. The world becomes divided into those who appreciate mangoes; the mango-lovers, and finally, the connoisseurs. As the connoisseurs will tell you, the ‘correct’ way to eat a mango is to cut it into three parts and bite deep into one chunk, allowing the juice to trickle slowly and stickily from your mouth to your fingers, palm, wrist… and all the way down your arm, till you lick it off just above the elbow. But for those who don’t need to savor it quite so bodily, visit Delhi for the annual International Mango Festival held at the colorful Dilli Haat in New Delhi’s Pitampura neighborhood every year. Here, over a three-day period in the ‘mango months’ of the summer, Delhi Tourism and the Government of Delhi organize a mango bonanza. All kinds of mangoes are flown in from all parts of India. Ever heard of the Bombay Green mango species? Nor had I. But it’ll be at the Mango festival, sitting proudly beside the Alphonso, the Langda, the Fasli, the Sindheri and the Chausa. Eleven hundred species of the fruit will be on display for visitors to taste, free of cost. Dilli Haat (or market) is an open-air market with a layout of different stalls selling handicrafts, art, fabrics and pieces from traditional craftspeople across India. There are several food stalls as well, and frequent folk dance performances. Over a few days in July next year, the Haat will be Mecca for all mango-lovers! The International Mango festival is not only about tasting raw mangoes; pickled, juiced, jammed, chutney’ed, pulped and papad-form mangoes are also available, for purchase. In between the tasting, visitors can participate in events structured around the mango as well, such as quizzes, mango-eating contests, mango carving contests, folk dances and events for children. The organizers haven’t confirmed the festival dates yet, but they are likely to be between June – July 2017. We’ll keep you updated right here! Similarly, other cities feature mango and other seasonal melas (festivals). In Bangalore, the Mango & Jackfruit Festival takes place annually in Lal Bagh Gardens during the month of May. Travel to India with Enchanting Travels, savor the mango festival in Delhi and participate in our other recommended activities!